Free Clipboard Manager is an (obviously) freeware application which automatically saves the content of your clipboard to a database which comes in handy for future use, especially when you've overwritten important information which was stored in your clipboard. 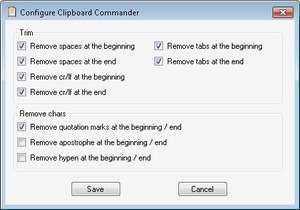 As anyone who often works with the Windows clipboard knows, it happens every now and then that the data stored there might be the last place the data was saved, even if you've accidentally closed the program containing the original data. $#&* happens, and once you've overwritten something in your clipboard, it is gone forever. That's why Free Clipboard Manager can be so handy at times when the non-existent features of the Windows Clipboard fail. Version 2.50 is a freeware program which does not have restrictions and it's free so it doesn't cost anything. For security reasons, you should also check out the Free Clipboard Manager download at LO4D.com which includes virus and malware tests. Additional screenshots of this application download may be available, too.